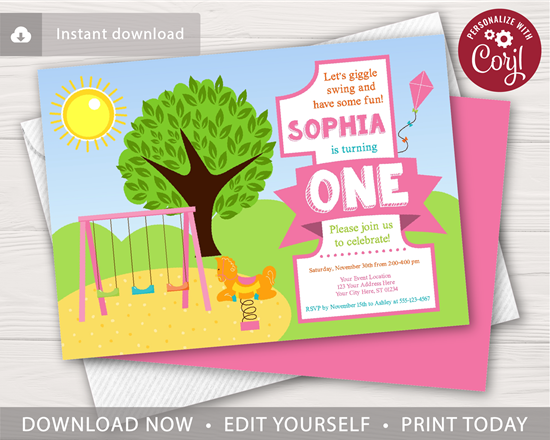 This editable and printable playground 5x7 invitation is perfect for a sunny day at the park celebrating a girl's 1st birthday party themed in pink, lime green, orange, and aqua. The invitation is available to download immediately after purchasing. Edit online with Corjl.com using your computer, phone, or tablet. No software is required. You can print, text, email, and share on social media with your guest! After purchasing, you will be able to download the custom url link via your Puggy Prints order history page. After clicking on the link and creating a Corjl account, you’ll be able to access your purchased item. Download your files and print! ● We do our very best to ensure that your digital file is crisp clear, colorful, and high quality at 300dpi resolution. Unfortunately, we have no control over print companies and the quality of service they provide. If for any reason your prints appear blurry, dark, or discolored, you will need to contact the printing company. © Puggy Prints. All rights reserved. Copyright © 2019 Puggy Prints. All rights reserved.